This album is around for some time, but as I only got acquainted with it through the delightful live show the band played after the superb TMGS show in Leiden last December (read on here: https://wonomagazine.blogspot.com/2018/12/tmgs-and-dieter-van-der-westen-band.html?spref=tw) I decided to pay it some, well-deserved attention. The atmosphere of Americana, of long and dusty trails in the U.S. are captured very well on Me And You. The endless road, dust, thirst and a destination that is still so far off. 'Driving Home', the opening song with its subtle fiddle, draws these pictures in my mind. Desert as far as I can look and beyond. "Driving home on my own", Van der Westen sings and he sure isn't happy with his situation. This is a very fine song to open an album with. In the title song again this laidback but also slightly dismayed mood hangs over it all. "There's nothing left to talk about", sounds sort of ominous for a relationship. The accompaniment is fitting. Sober, yet full. The drums and bass lay a natural foundation for the other instruments to play over. There's an acoustic guitar, but also either a banjo or dobro and a fiddle. Slow notes escaping the background, providing the songs with its texture but also something sad. The slightly rough voice of Dieter van der Westen makes things off. There's no space for happiness with a voice like that it seems. So Me And You is not a happy album. At the same time there is so much to enjoy. Van der Westen and his band capture beauty. The subtle kind. So when the listener settles in and listens to what is presented, it is highly likely that (s)he'll be caught by this beauty. I personally find it easy to be enraptured by this music and thoroughly get treated by music that is captivating in several ways. Beside pleasant songs, it is clear these musicians are very accomplished, they sing well together and manage to bring something special to each single song. 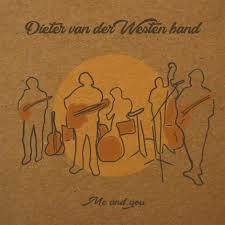 Moving into the album Dieter van der Westen Band also gets more varied in its songs, adding another plus to the already positive picture. To top things off, the band presents its version 'Jesse James'. The kind of song that is easy to sing along to, but also has an authenticity that spans the nearly 100 years since the song was first recorded in 1924 by Bascom Lamar Lunsford. Next up is a totally off record song, bringing in a kind of funky stuff, the title reminding me of Sly and the Family Stone. It may be so different, again it is done so well. Another side to this band for sure. As you can read, there are many reasons why trying out Me And You might be a good idea. It's about time you do so if you haven't so far.